Technically it is still WCMD... I had intended on posting earlier and posting more than this one card. BUT....My boys both went to Homecoming tonight, and trying to get clothes ironed, and things ready for the kids to come back here after the dance, left me with little creative time. I used the Basic Grey Sketch Challenge for my layout inspiration. The Basic Grey papers I used are from Wisteria and Perhaps. I did a little Drywall Stitching on the Baisc Grey papers. All stamps are from Kitchen Sink Stamps. I stamped the Script from 3 Step Letters from the Past in Soft Suede on Soft Suede card stock, then stamped Butterfly #3 from 3 Step Butterflies over the script in Chocolate. For the focal Butterfly, I brayered a piece of White card stock with Blue Frost Ink, then stamped #2 in Chocolate Chip, #3 in Chocolate Chip, cut out and layered on the Soft Suede piece using dimensionals. The smaller butterflies were also stamped on the Blue brayered card stock, stamped #3 in Chocolate Chip, #2 Chocolate Chip stamped off. I stamped a small Swash in Desert Sand from the Big & Bold Swashes on the Basic Grey panel, then adhered my small Butterflies with Glue Dots. 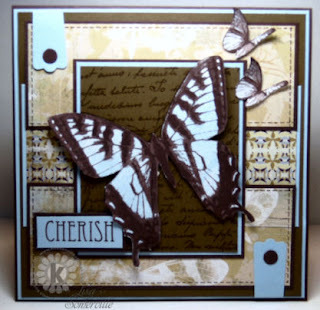 Cherish from Vintage Words is stamped in Chocolate on Bliss Blue. Lisa, your card is gorgeous!!! What a beautiful card! Love it! Gorgeous, Lisa! This layout really showcases the beautiful butterfly images. Just jumping around trying to find 2 BC gals who I cased from in Oct, and found this GEORGOUS card!